The constellation Cassiopeia is one of several constellations that have their origins in the Perseus myth, for Cassiopeia was the wife of Cepheus, the Queen of Aethiopia and the mother of Andromeda. It was the hubris of Cassiopeia, by comparing her, and her daughter's beauty, to that of the Nereids, that brought forth Poseidon's revenge, in the form of the Aethiopian Cetus. The Aethiopian Cetus was a sea monster that ravaged Aethiopia, and just when Andromeda was due to be sacrificed to it, so Perseus swooped in to rescue the princess. 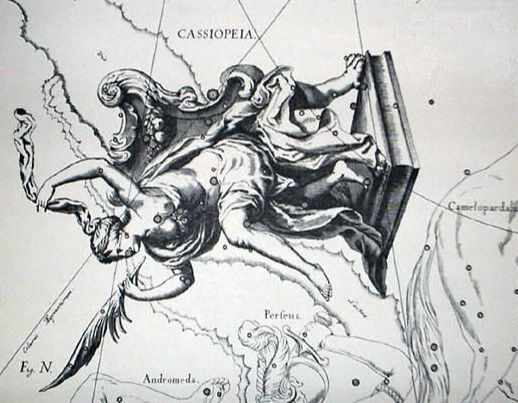 The constellation Cassiopeia rotates around the North Pole, and as Cassiopeia is thus seen hanging upside down, this is seen as a punishment from the gods to deal with the hubris of Cassiopeia.